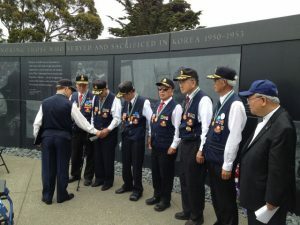 The past three months have seen a number of commemorations and ceremonies at the Korean War Memorial in the Presidio of San Francisco. 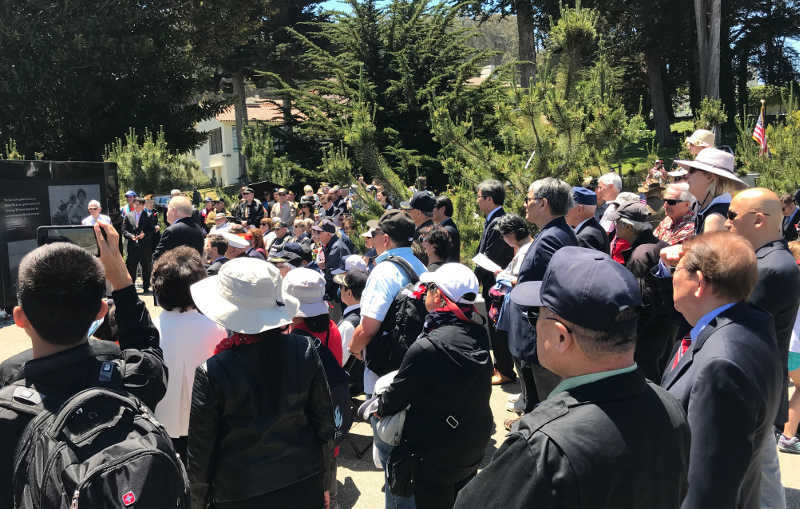 And the size of the crowds has been increasing significantly, due in part to the high visibility of the Korean crisis on the world stage. 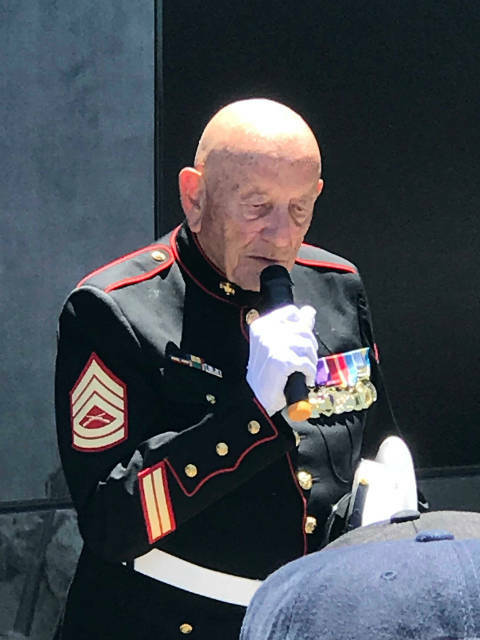 What follows are summaries and photographic highlights of these ceremonies, starting with the most recent in June, and working back in time to April. 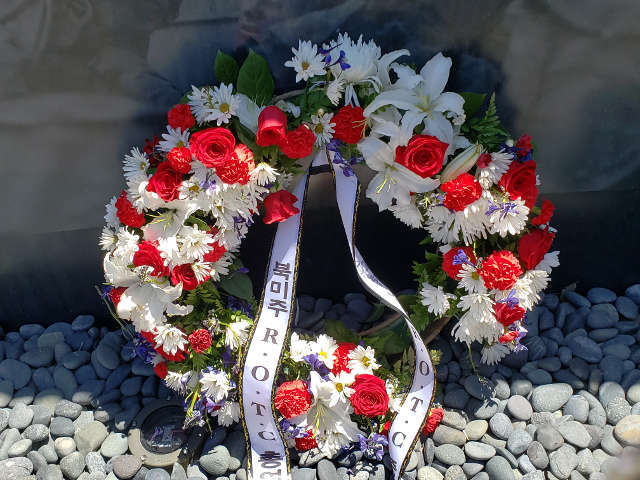 On June 25, KWMF held a ceremony at the Memorial to commemorate the 68th anniversary of the start of the Korean War. 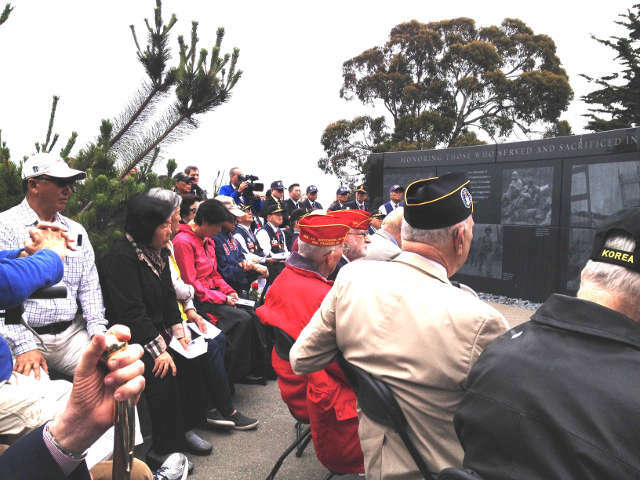 This date is a solemn occasion of momentous import to all Koreans and Korean-Americans. 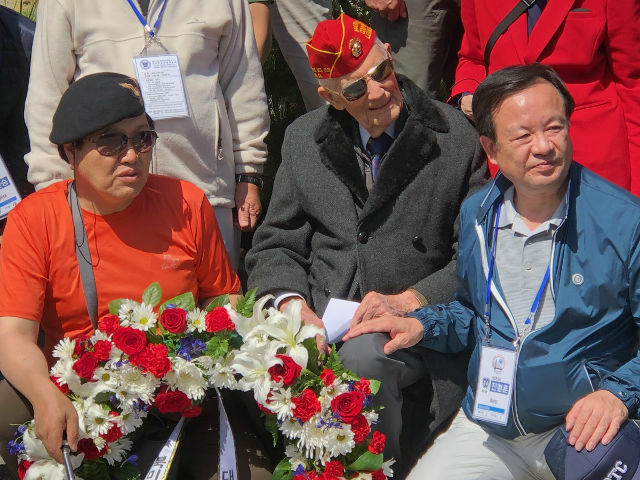 This was made evident by the strong turnout on this day by Korean-Americans who fought for the Republic of Korea during the war. 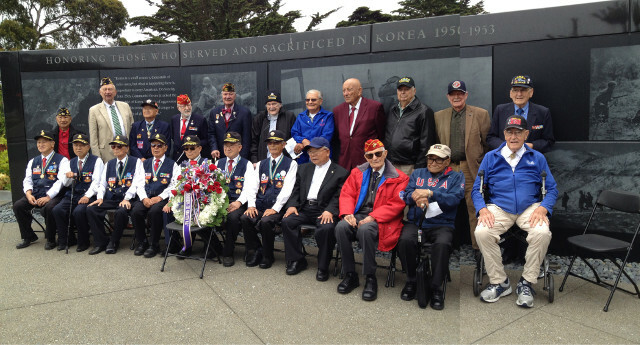 These veterans are devoted supporters of all of KWMF’s activities. 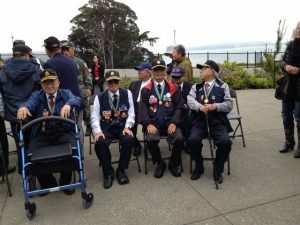 Some of these Korean veterans showed up an hour and a half before the ceremony began. 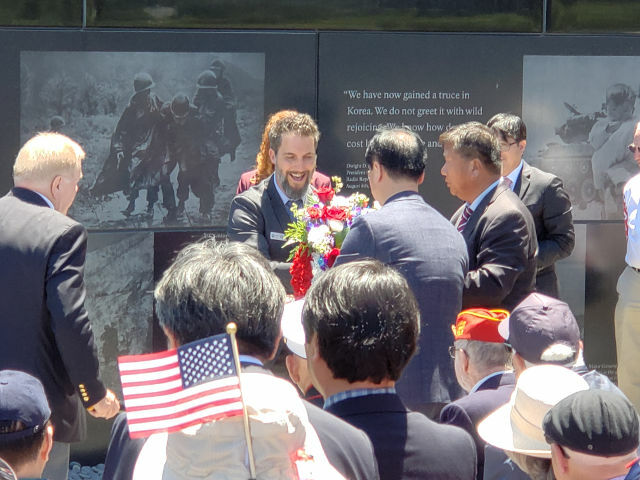 The ceremony included a performance of the Star-Spangled Banner by Noah Griffin, Founder and Creative Director of the renowned Cole Porter Society; a performance of the Republic of Korea National Anthem by Joanne Cho, President of the Global Children’s Foundation; remarks by Judge Quentin L. Kopp (Ret. 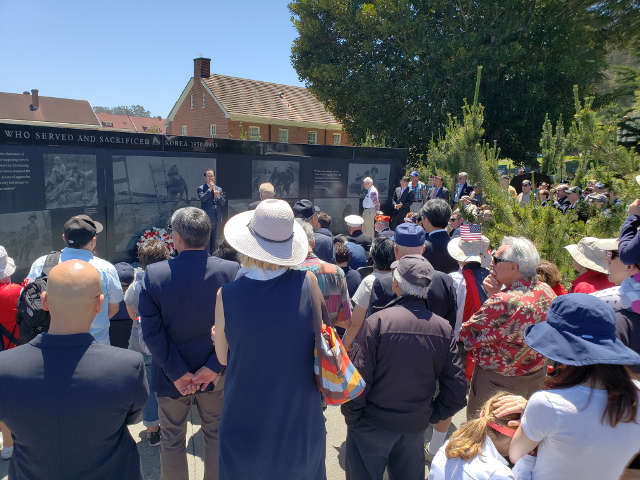 ), President and Chairman of KWMF; Consul General Park Joon-yong of the Republic of Korea; Eric Blind, Director of Heritage Programs at the Presidio Trust; and KWMF Vice President Man J. Kim. 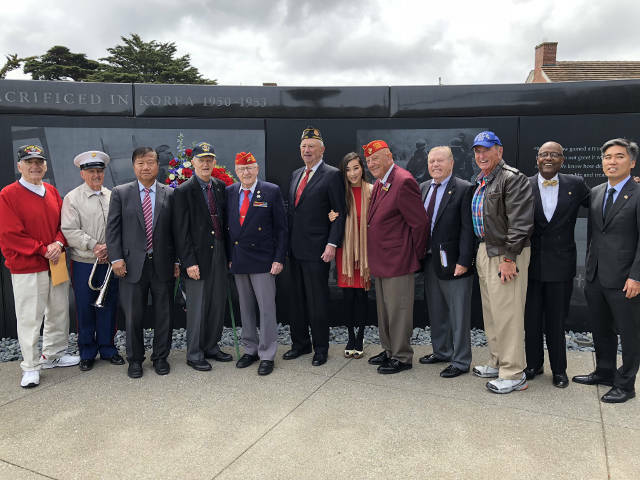 A welcome last-minute addition to the program was a performance of “Remember June 25” by Linda Park and her group of singers. 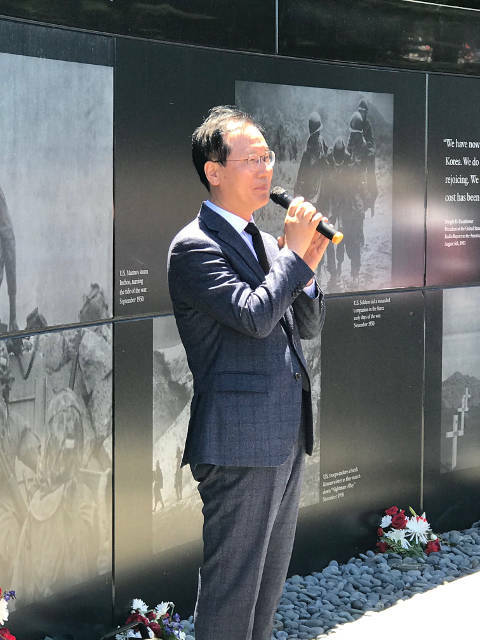 This song is much beloved in South Korea, where it is traditionally sung at ceremonies throughout the country on this important date. 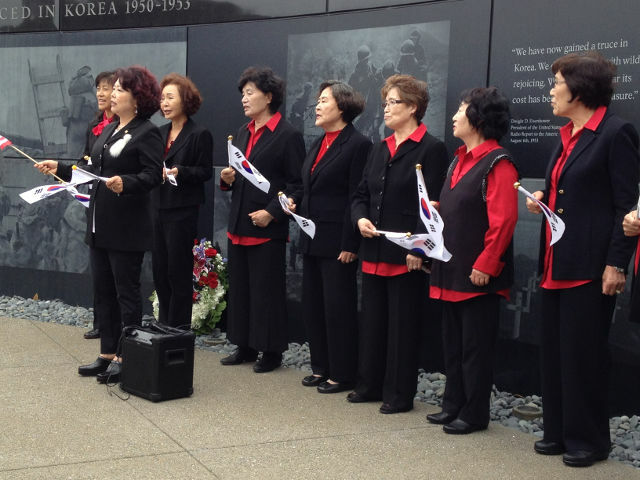 The women’s spirited performance was a big hit with our audience. 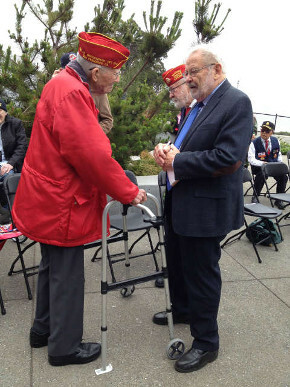 Brothers in arms, commemorating that long ago, faraway war. 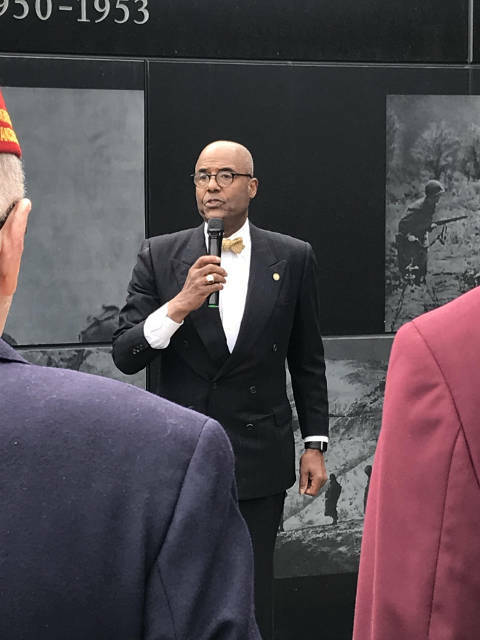 Standing tall on the left, in the tan suit, is KWMF President and Chairman Judge Quentin L. Kopp (Ret.). 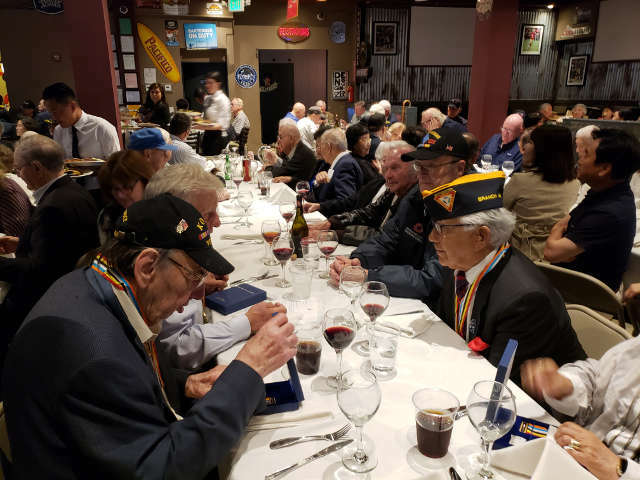 Following the morning ceremony, the Korean War veterans and their guests headed for the Golden Gate Grill in downtown San Francisco, where the restaurant’s owner, KWMF Vice President Man J. Kim, was hosting his 16th annual luncheon for all Korean War veterans and their families. 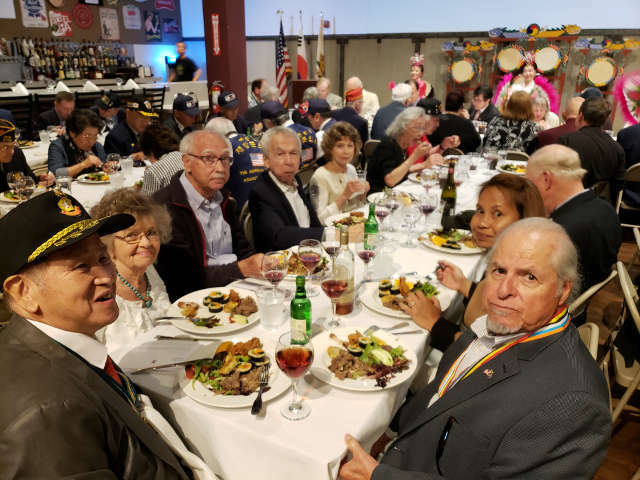 More than 280 guests enjoyed fine food and wine as well as live entertainment by traditional Korean performers – all free of charge, thanks to gracious host Man J. Kim. 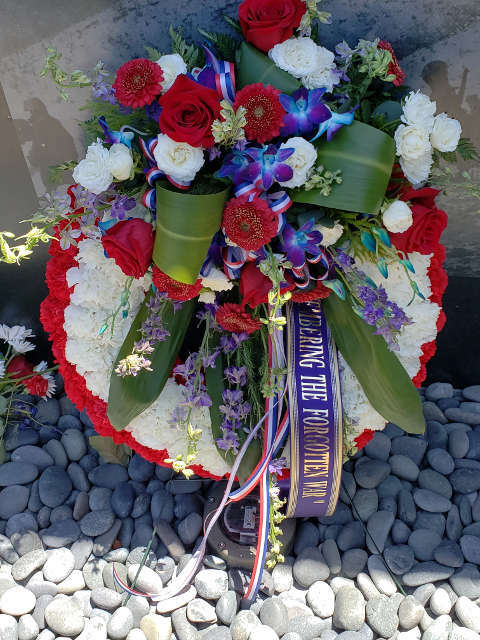 The following is a chronological summary in pictures of the Memorial Day commemoration. 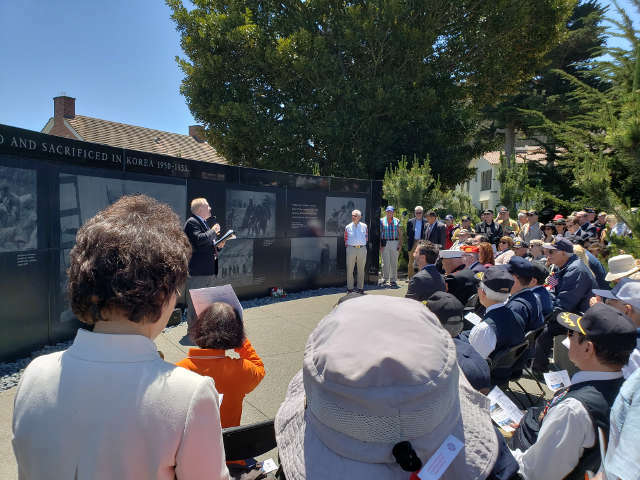 Michael Lamb, Historic Landscape Architect, the Presidio Trust, key member of the team that designed the Korean War Memorial. 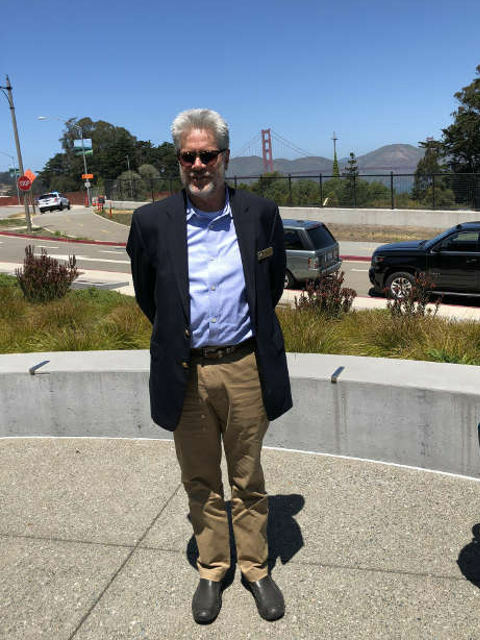 Behind him is the Golden Gate Bridge, and just beyond that, the Marin Headlands, which happen to lie on the 38th Parallel. 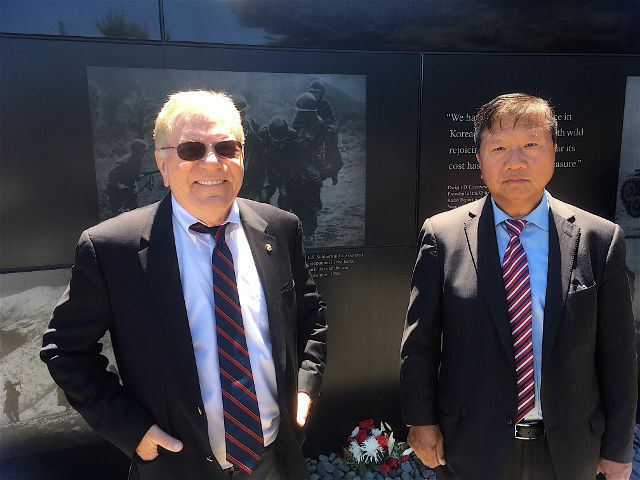 In late May, we at KWMF were pleasantly surprised to learn that we were to have an unexpected visit from members of an association of former Republic of Korea ROTC military officers. 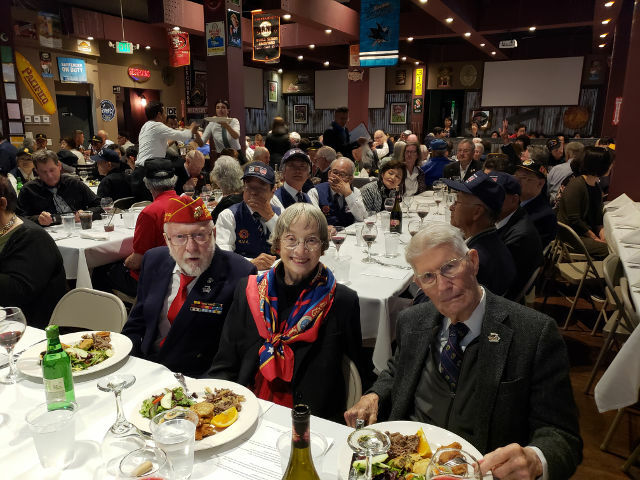 They were in San Francisco for their association’s annual reunion, coming together from South Korea as well as from local chapters of their ROTC association here in the United States. 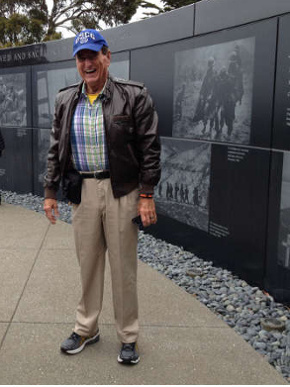 And on Sunday, May 27, they showed up at the Korean War Memorial for an informal tour: several busloads of them! 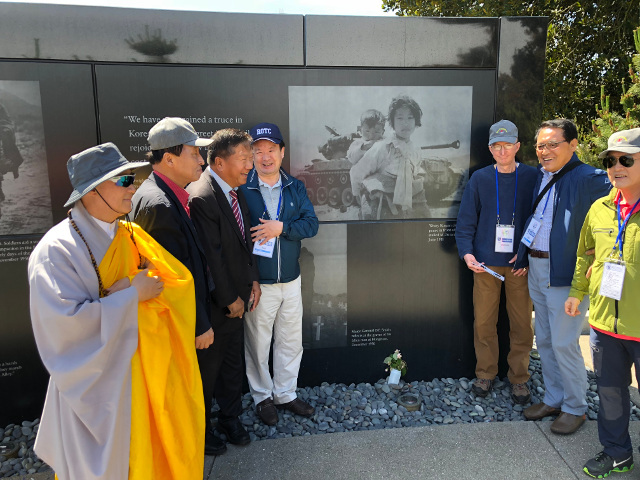 They were welcomed by KWMF’s officers and other friends, who showed the guests around the memorial, exchanging pleasantries, getting to know one another, and posing for photos. 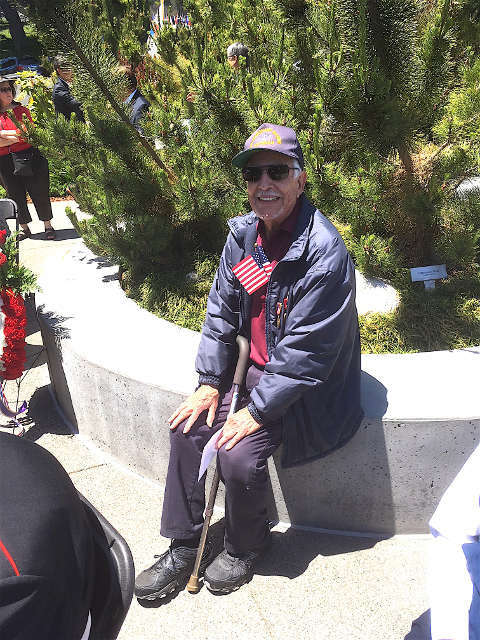 Many of the guests didn’t speak much English. 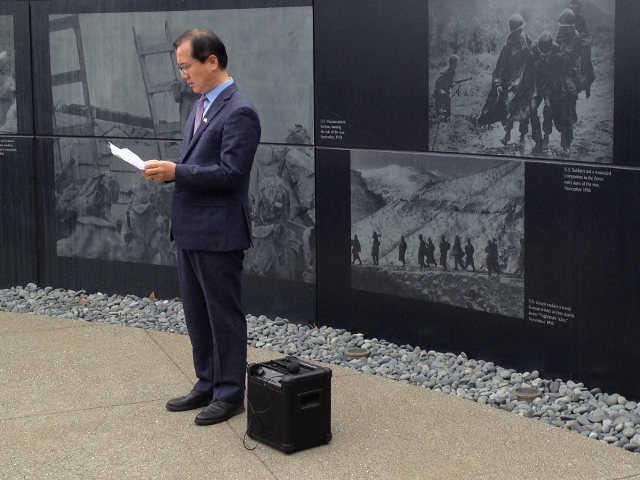 Fortunately, KWMF Vice President Man J. Kim served as unofficial translator and tour guide. 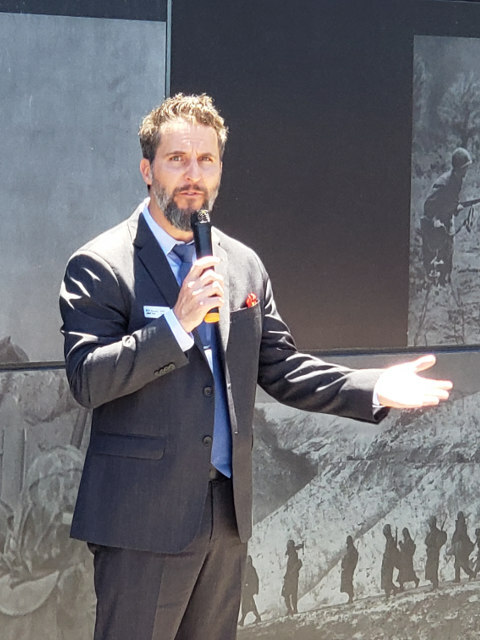 He also made his debut as a standup comic, when he tried to persuade some of the guests that the photo of the Korean baby etched on the Memorial wall was none other than. 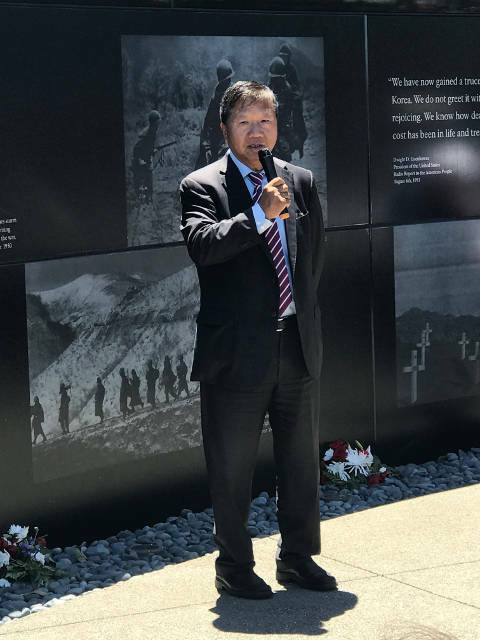 . . Man J. Kim himself! 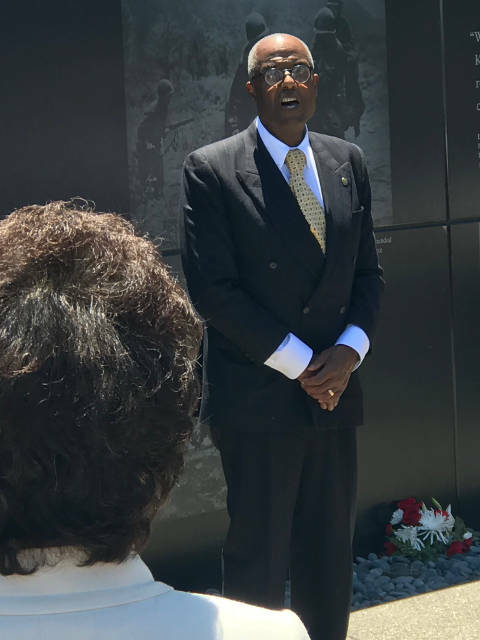 He then admitted sheepishly that a DNA test might prove him wrong. 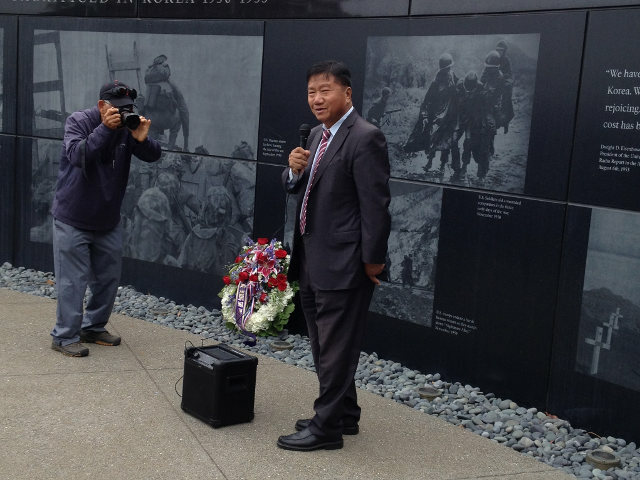 Man J. Kim tries to persuade the guests that he is the baby on the wall. They don’t seem convinced. 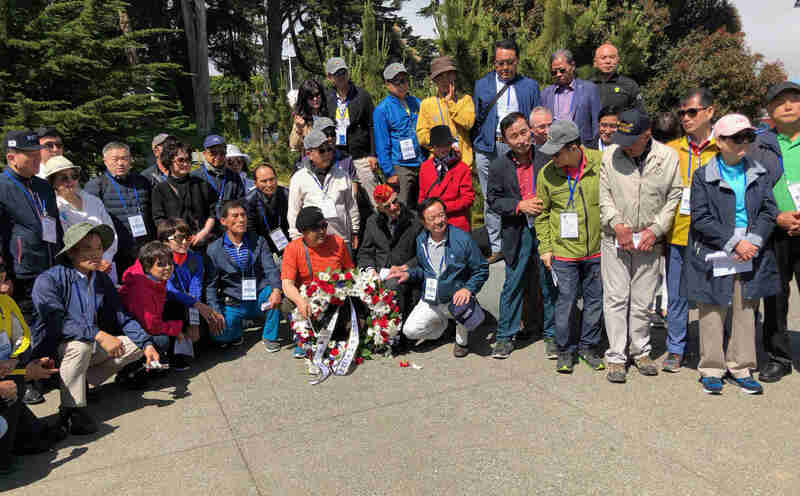 On Saturday, April 28, Hannah Y Kim, a woman with a mission, paid a visit to the Korean War Memorial in the Presidio of San Francisco, and presented a ceremonial wreath. 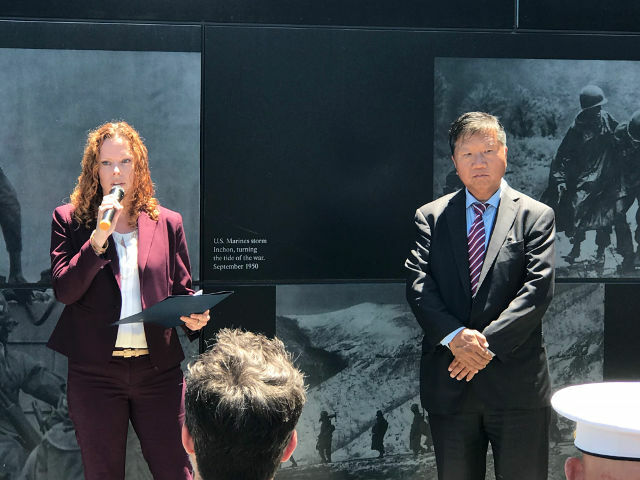 This was the beginning of an ambitious three-month journey by Hannah, visiting Korean War memorials in all 50 states, to honor and remember those who served in that conflict, and to help promote a lasting peace on the Korean Peninsula. 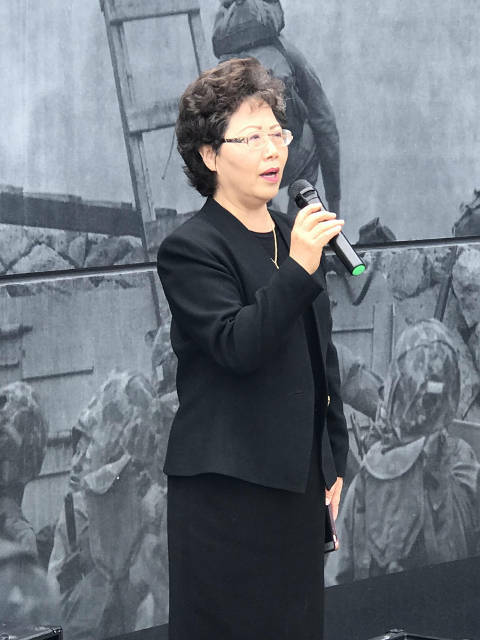 Given the alarming level of tensions in the region today, her mission could not be timelier. 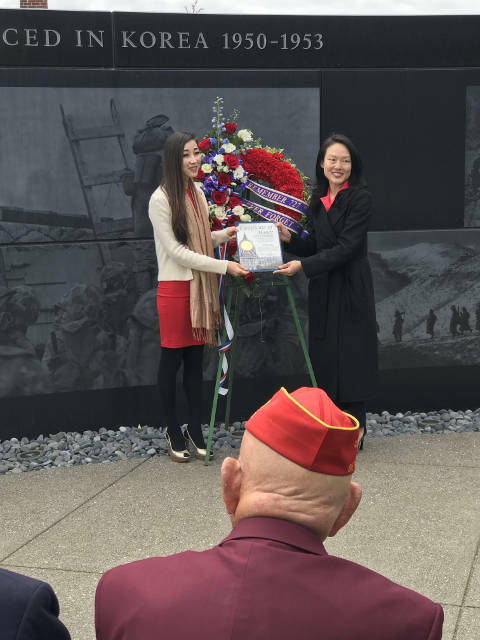 A highlight of the ceremony came when San Francisco Supervisor Jane Kim presented Hannah with a Certificate of Honor from the City and County of San Francisco. 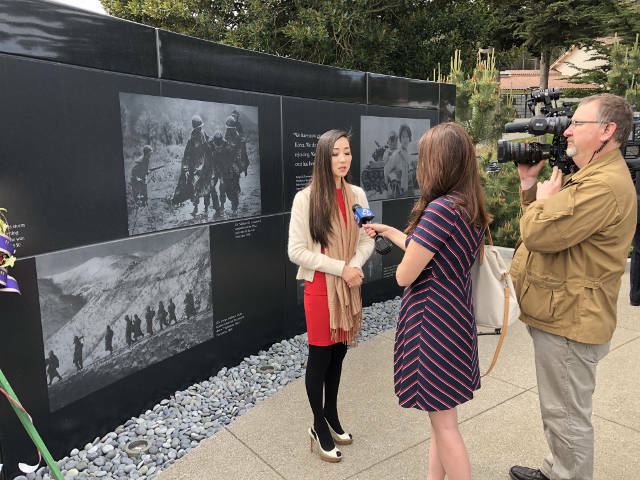 Following the ceremony, Hannah Kim was interviewed by members of the media, including ABC7 TV News San Francisco, and then posed for memento photos with a group of KWMF’s members and guests. 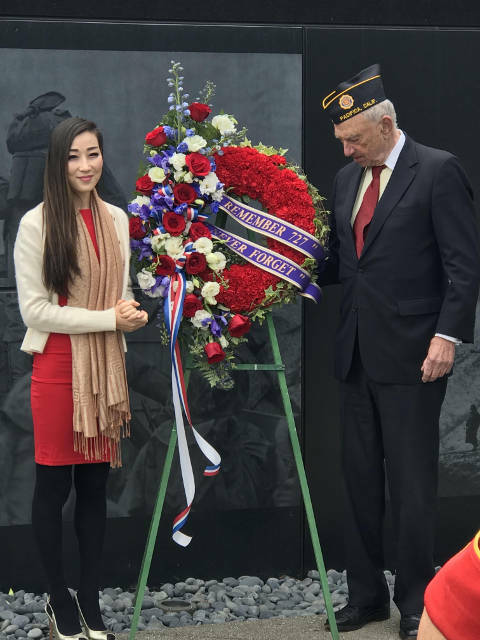 Hannah Kim’s devoted activism on behalf of Korean war veterans began in 2008, when she was a 24 year old graduate student in Washington, DC and launched “Remember 727,” an organization dedicated to honoring the veterans. 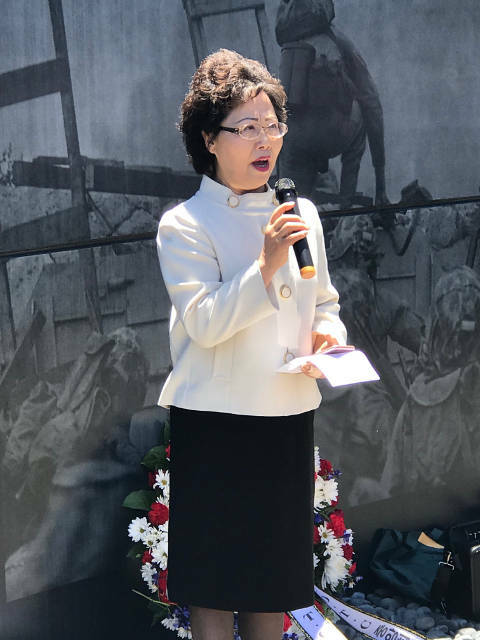 She lobbied Congress to enact legislation, signed into law by President Obama in 2009, that established July 27(“727”) as National Korean War Veterans Armistice Day. 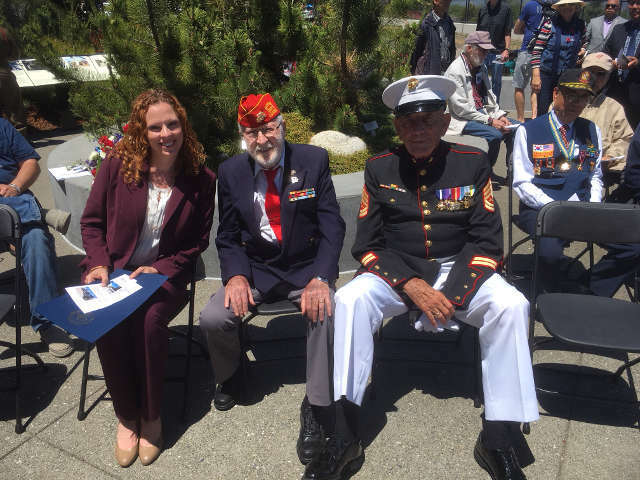 Hannah subsequently worked for Congressman and decorated Korean War veteran Charles B. Wrangel, initially as his communications director and later as his chief of staff. 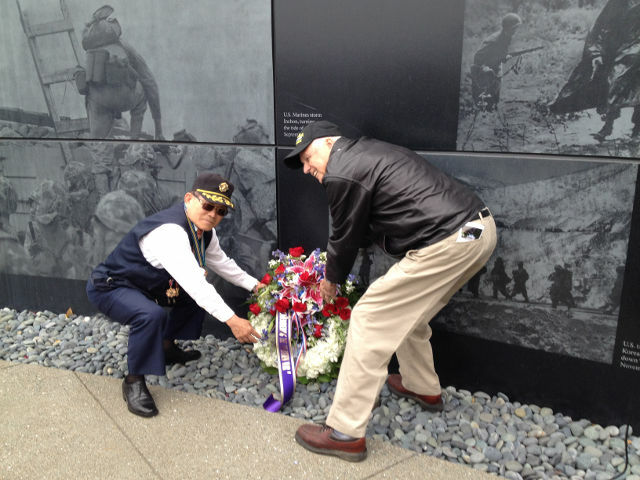 At present she is just reaching the Korean war memorials on the East Coast, after more than two months on the road.